The title of this picture is a bit of a misnomer. The film is certainly no miracle, nor are there any profound miracles in the story. The story of the real Santa who inadvertently becomes a fake Santa in the Macy’s Day parade who then has to prove he’s the real Santa in order to get himself out of an insane asylum is a decent Christmas flick. A kind of like Frank Capra-light , with unabashed humanist sentimentalism but without the dramatic and emotional gravitas which gives you those warm fuzzies in the Christmas season. 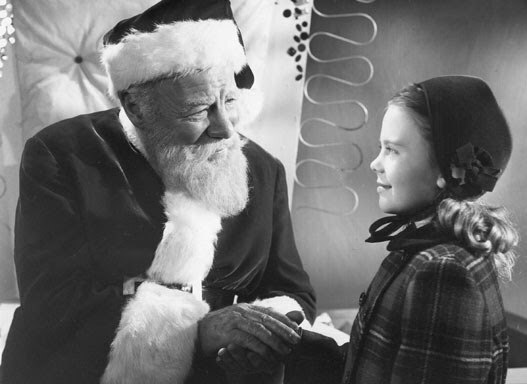 A jolly old portly guy with a white beard and red suit (Edmund Gwenn) happens to walk into the New York Macy’s Day parade one November afternoon. He happens to bump into Doris Walker (Maureen O’Hara) the rational thinking business woman who's managing the event. When the hired parade Santa shows up drunk, she’s quickly convinces this other kind gentleman who happens to be wearing the outfit to take his place. The man’s name happens to be Kris Kringle and is thus the real Santa. After the ceremony, Kris is hired to become the permanent department store Santa at Macy’s. But Kris keeps insisting he’s the real Santa. When Doris and her superiors start to realize he’s not just method acting and that he actually believes he’s Santa he’s sent to the looney bin. But Kris is so effective as the department store Santa, who speaks to the children and adults with a refreshingly honest and optimistic tone. Kris develops a relationship with Doris’ daughter Susan (Natalie Wood) who has been taught all this time that there is no Santa. When Susan is encouraged to just ‘believe’ this causes conflict with the rationally thinking Doris. Eventually when the trial against Santa begins everyone’s faith in myths and joy of the yuletide season are put to the test. The trio of Edmund Gween, Maureen O’Hara and Natalie Wood form a solid foundation of Christmas warmth. The portrayal of Doris as a single working mother could be seen as a very progressive characterization of women. She could be seen as doing man’s work, but it’s never referenced, and her upbringing of Susan on her own is admirable and years ahead of its time. O’Hara, the radiant curley haired Irish beauty and favoured John Ford-player is both matronly and cool-confident. Natalie Wood, then a precocious child actor, has the spark of the greatest child actors in Hollywood history. She exudes both innocence and maturity. And Gween, who won an Oscar as Santa is really the final word on Santas on films. If anything, the story relies too heavily on the trial of Santa, and leads up to the rather silly legal technicality which gets Kris Kringle off. When the postal workers march up into the courtroom and dump all the Santa letters on the judge’s table it doesn’t exactly resound with a cinema aura of goodness, it feels more an attempt at Capra-esque charm. One can’t help compare “It’s a Wonderful Life” with ‘The Miracle on 34th Street’. Both were made a year apart, and featured shamelessly virtuous titles. If anything, what “Miracle” lacks in miracles it is makes with its modernist view on consumerism and it thus worthy, but not the final word on Christmas movies. I need to grab a copy! Your reviews intrigued me. Just got the DVD! NICE movie.